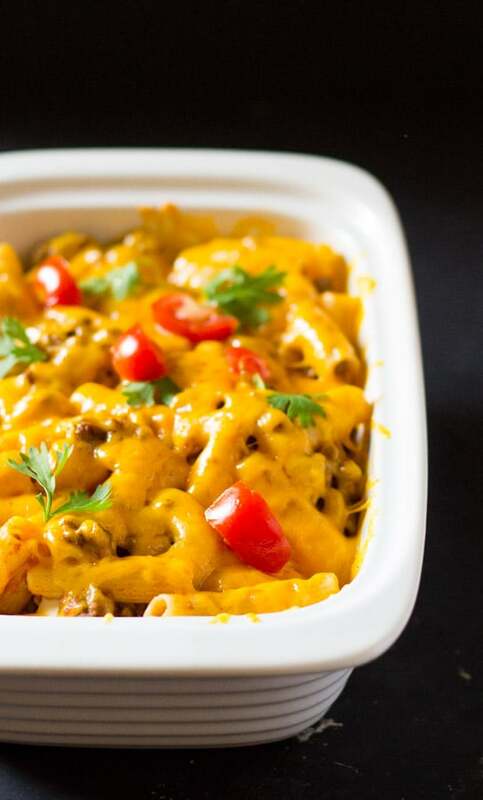 This Cheesy Baked Beef Rigatoni is everything. 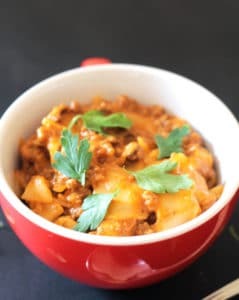 It’s loaded with cheese, it’s got a hearty meaty ground beef sauce and a creamy garlic white sauce and is basically everything you would look for in a quick weeknight meal. So if you’re having a bad day at work, and are dreaming of a comforting dinner, this is the perfect recipe for you. 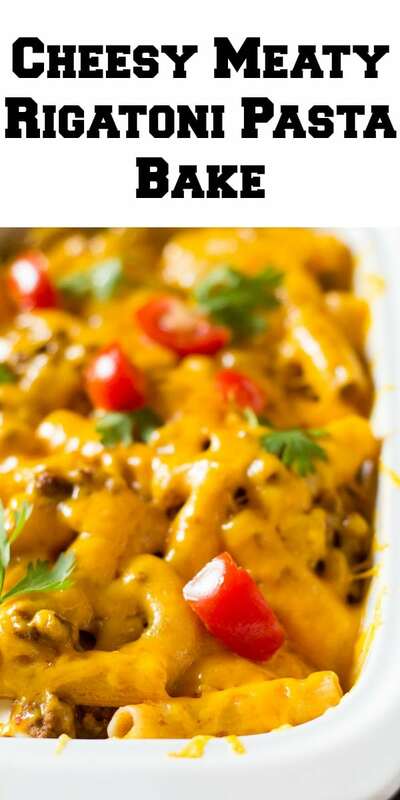 I mean, just look at all that golden cheddar cheese, and tell me you don’t want this for dinner tonight. And if you’re a cheese hater then I’m afraid we can’t be friends. 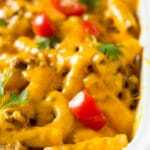 And if you’re a cheese lover, then this rigatoni bake with ground beef and cheese is the perfect dinner recipe for you. The ingredient list may a little seem long, since there are two sauces involved, the actual process is pretty quick; especially if you multitask. The ground beef meat sauce is made using a few pantry spices and jarred pasta sauce, which makes the whole process delicious and faster. The white sauce is also very easy and made with a few simple ingredients and just adds a delicious creaminess to the whole dish. 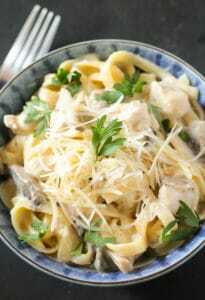 You can of course skip the white sauce if you don’t feel like making it (we’ve all been there) but I would highly recommend putting in the effort because it adds that oomph to the pasta dish. 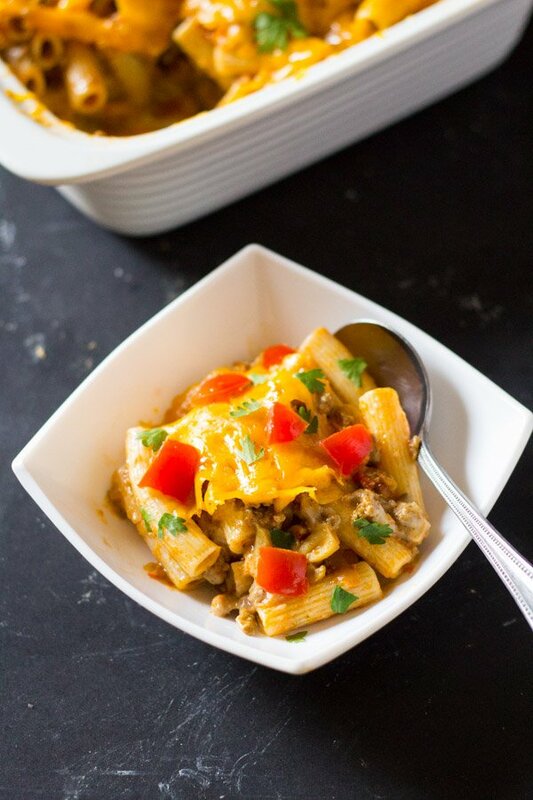 I love using rigatoni in this dish because it soaks up all the sauciness and is succulently delicious in each bite. 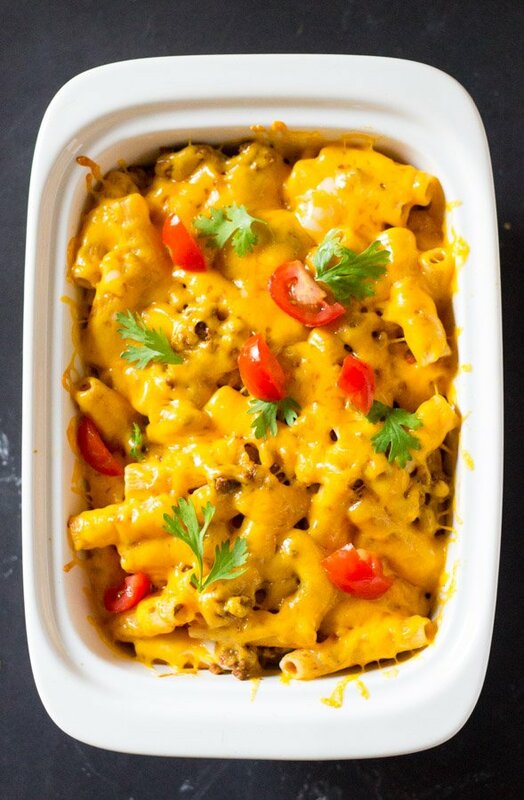 Once you’ve made both the sauces, and cooked the pasta, all you have to do is layer all this deliciousness into a large baking tray or casserole. And then top with lots of cheddar cheese and baaaake until the cheese has melted and is all bubbly. Yay! Your new favorite comfort pasta dish is ready, so bring out your fork and dig in! Heat the oil in a large pot, and add the chopped onion. Fry the onion until slightly translucent and then add the ground beef and all of the spices. Cook until the beef is browned - about 10-15 minutes. Now add the mushrooms and cook for a few minutes (about 3-4 minutes until the mushrooms are cooked through). Finally add the pasta sauce and cook for a few minutes and then turn off the heat. Set aside. In a medium saucepan, melt the butter on medium heat and then add the flour. Cook fro 1-2 minutes and then slowly pour in the milk, while continuously whisking. Continue whisking for 5-6 minutes until the sauce thickens. Season with salt, pepper and garlic powder. Take off heat, and set aside. In a large baking dish, first start by layering with spreading a bit of the white sauce, and then some of the meat sauce. Now add a layer of pasta, then layer with the meat sauce, and then layer with white sauce. Repeat layers and then top with cheddar cheese. Bake at 375 F/190 C for 10 minutes or until the cheese has melted and is golden brown. I don’t see the recipe on here anywhere. Can you help? 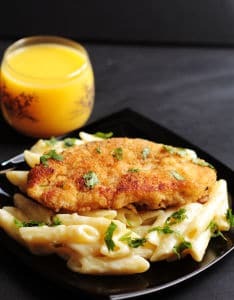 This looks delicious and my son wants to try it! Hi Michael! I’m so sorry for the inconvenience, there was a technical error which made the recipe card disappear. I’ve fixed it now. Thanks for letting me know!